The fifth annual Sir Jeremy Lever lecture was held on Friday 5th February by the Oxford University Law Faculty in combination with All Souls College. The lecture series celebrates the career of Sir Jeremy Lever KCMG, QC, a pioneer of both the practice and academic study of competition law in Europe. The lecture titled “Personal Data Protection: The Contribution of the European Court of Human Rights” was given by Dean Spielmann, Former President of the European Court of Human Rights and chaired by The Rt Hon Sir Stephen Richards. 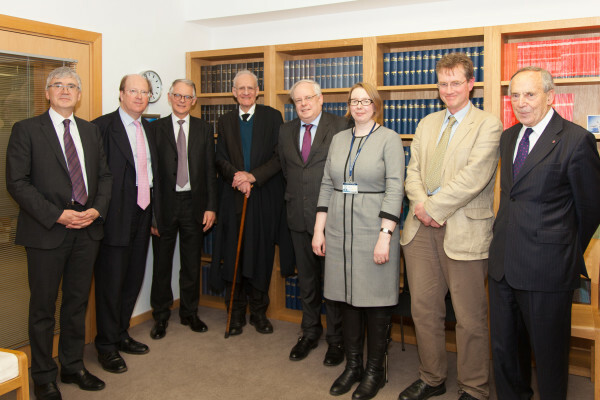 Left to right: The Rt Hon Sir Stephen Richards, Paul Lasok QC, Piers Gardner,Sir Jeremy Lever KCMG QC, Dean Spielmann, former President of the European Court of Human Rights, Professor Anne Davies,Dean of the Oxford University Law Faculty, Professor Stephen Weatherill, Professor Sir Francis Jacobs. The event was followed by a celebratory dinner at All Souls College.